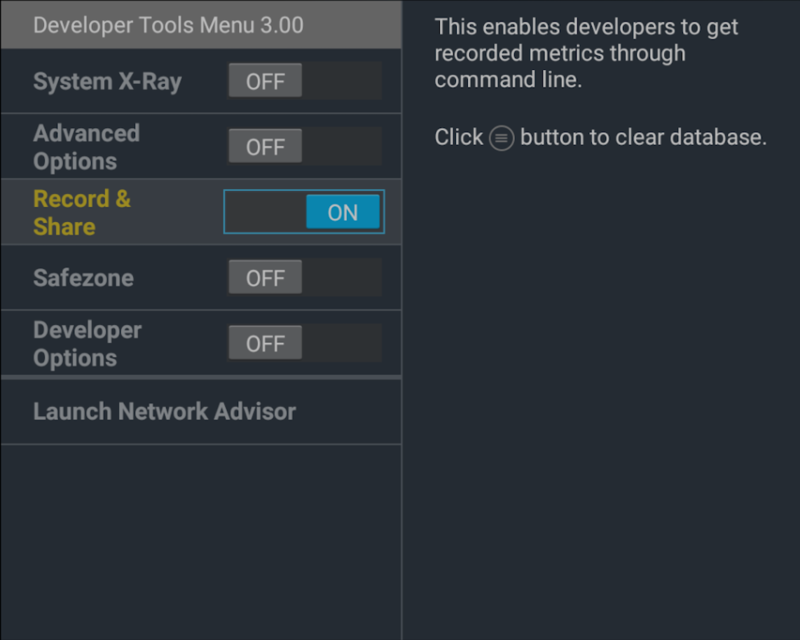 The Developer Tools Menu provides a number of options that provide real-time metrics and other information about your app. This information can assist you in troubleshooting, development, and testing. System X-Ray gathers instantaneous system metrics and displays on top of the screen as an overlay. When toggled on, the overlay will always be visible on the screen. For deep-dive into System X-Ray, see System X-Ray. Note: Advanced Options is not available on Fire TV Stick Gen 1 (due to limited system resources). 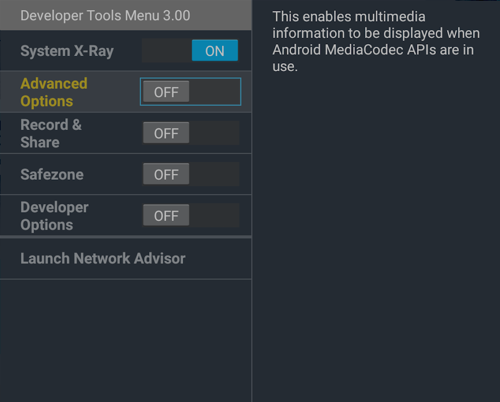 Advanced Options enables multimedia information to appear when Android MediaCodec APIs are in use. When you switch this option on and then play media, an additional display (titled "MUL" for Multimedia (audio and video) and "AUD" for Audio Focus) appears on the right. Information displayed in the Multimedia panel is divided into three sections: Audio, Video, and Audio Focus. 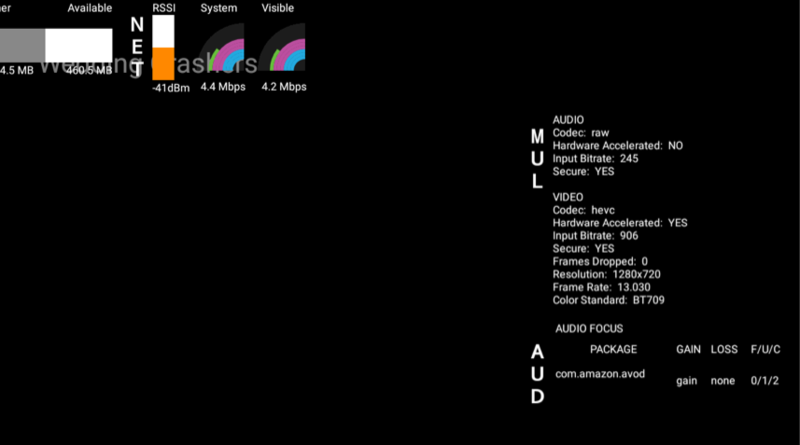 Note: The Audio Focus section is only available on Fire TV (Gen 3) devices. Flag (F): Flag value for audio focus request. For more info, see AudioManager.java#2445. Content (C): Content value. Enum Values for Usage and Content can be found here: AudioAttributes.java#72. Snapshot provides a way for users to gather instantaneous all metrics information through adb command. Whenever you input the following command, metric information will display in the command line. System X-Ray must be running for this command to function. Note: The Record & Share feature is in experimental beta, so be aware that this feature may have some issues. For example, if the memory is too large, the output may time out. Record & Share stores instantaneous metrics about CPU, memory, network, and multimedia into a database as historical data. Although the same information is displayed graphically in real-time through the System X-Ray overlay, Record & Share takes this information and stores it into a history that you can dump to the command line. 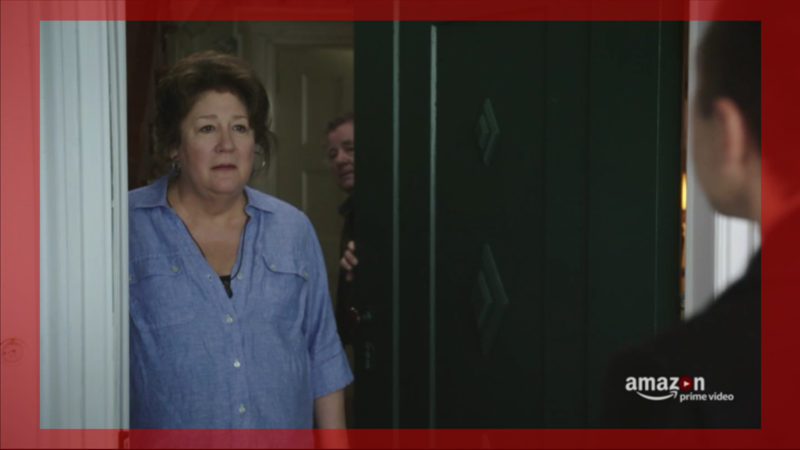 Interval: The time between two recordings: 2 seconds, 4 seconds, 8 seconds, 16 seconds, or 32 seconds. Duration: How long the data gets stored in the database: 1 hour, 2 hours, 4 hours, 8 hours, or 16 hours. The default (2s interval, 1 hr duration) means that every 2 seconds, statistics will be recorded and stored in the database. The recording will be stored in the database for a total of 1 hour. 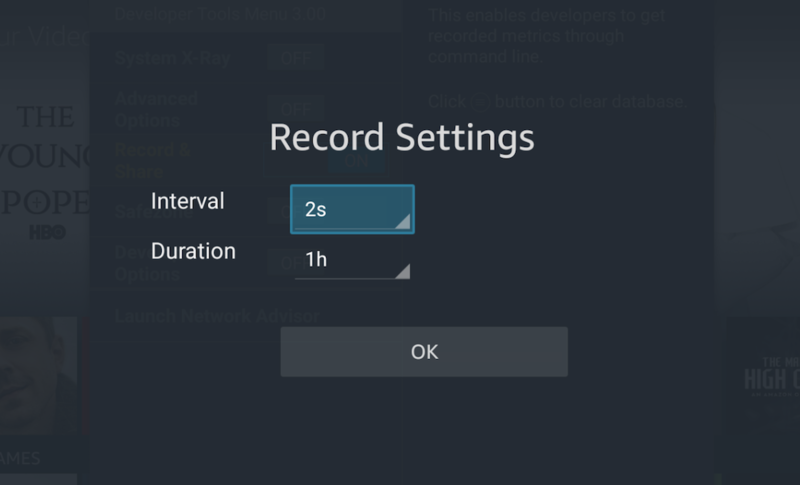 You can clear the recorded metrics stored in the database (before the duration time automatically clears the data). From the Developer Options Tools menu, select Record & Share, and then click the menu button on your remote. Some TVs use overscan with their display. Overscan means the TV displays some information off the edges of the visible screen (to accommodate discrepancies in monitors). You should not display important information in the overscan areas. To make the overscan areas visible, you can turn the SafeZone switch to On. This will make the overscan areas apparent so you can avoid displaying any information in these areas. Note that Fire TV Stick (Gen 2) does not include screen size calibration. If the screen display doesn't fit correctly on the TV screen, the overscan area may not show accurately. Currently, some third-party apps, such as Netflix and HBO Go, display recommendations on the Amazon Fire TV home screen in specific rows. For more information on recommendations, see Recommendations Overview. Developer Options allows you to turn on a row called "Recommended By Your Apps" (displayed below the Netlix and HBO Go rows). This "Recommended By Your Apps" row will show recommendations sent from third-party apps. Turning this row shows recommendations from all third-party apps the user has installed (excluding some apps such as Netflix and HBO Go, which display recommendations on their own rows). Launches a network analysis window that checks your network connection strength, channel, and other details. If there are problems, the Network Advisor provides recommendations to fix the issues.